I decided to write about three projects in Ljubljana focused on sustainable development and social enterprises. First one is Cultural – ecological fellowship Smetumet (trash-art). Their goal is to show a new perspective on trash and recycling, showing us that we can be a part of “reduce, reuse, recycle” principle in different ways, not just by throwing trash in separated dumpsters. The beauty of this project is that we can play with our garbage, using creativity and our imagination. With all that we can transform rubbish into new useful and wonderful things. One of the great missions is focused on old clothes. Why do we need to throw away old stuff, just because something new is cheap? We can redesign old ones and give them our personal touch. With the similar “do it yourself” theory they are encouraging us to make our own toys, cosmetics, food, furniture etc. as a statement of standing up against consuming society. 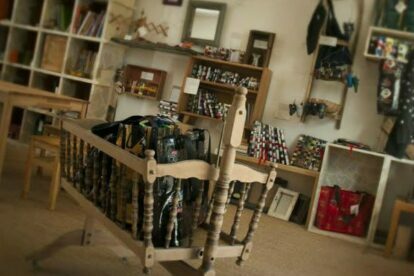 They have their ‘cradle’ in Šiška, where they have different workshops and where you can buy their products made from collected trash. One of my favorite items is wallet made from baby food (Čokolešnik and Čokolino) packaging. I also like that they are located in Šiška, giving this area new quality programs.